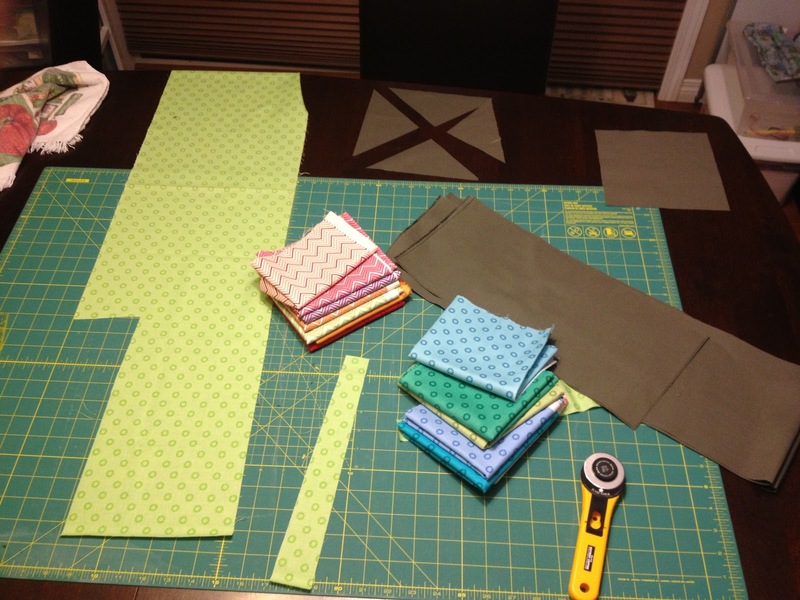 Our guild has decided to do a group Quilt Along to 42 Quilts Modern Monday Quilt that Jennifer did as a QAL last year on her blog. Its 64 modern/improv blocks all based off of traditional blocks. Part of me is beyond excited and a huge part of me is terrified - improv means to wing it - I wing it lots but I usually have a clear plan of what I'm doing while I'm winging it! (its more of a controlled winging) I think this will be a great project to help bust me out of my rut along with push me to try some totally new and very different techniques that I am NOT used to doing. 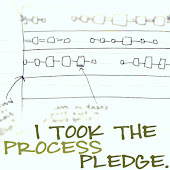 Its time to step outside the comfort zone and get it done! I pulled some fabric from my stash and am about to get to work! 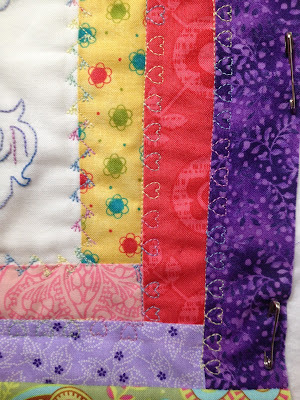 I'm thinking about calling this Quilt - Manic Monday but I might change the name as I go along. Wish me luck! This improv thing should be interesting. I'm back! Its been a really great few weeks off and I'm looking forward to sharing my latest work that I have on the go. 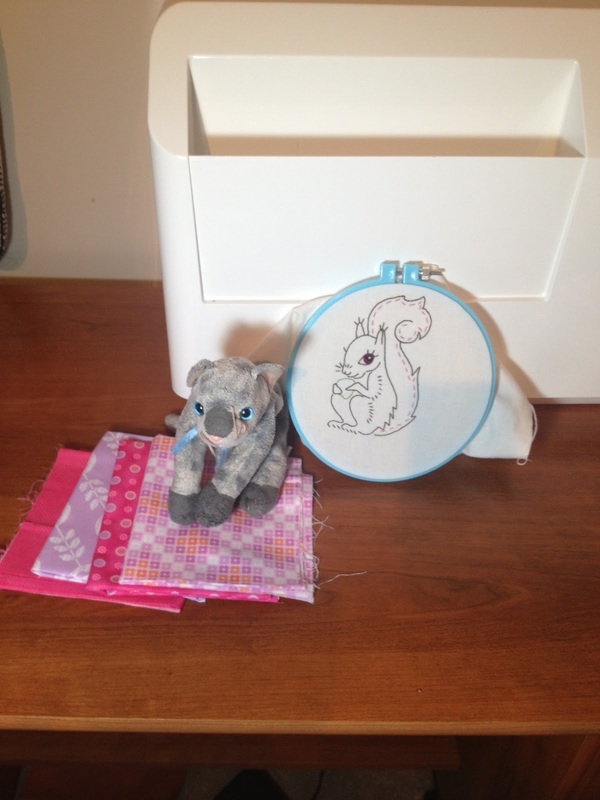 My Step-Sister Sherry of BS Crafts and I have decided to start a Stitching Tuesday weekly post about what stitching/embroidery projects that we are working on (even though we are three provinces away from each other!). I'm still starting out but I am really looking forward to working on some cute pillow cases and kitchen towels to give as gifts for friends and family at Christmas. 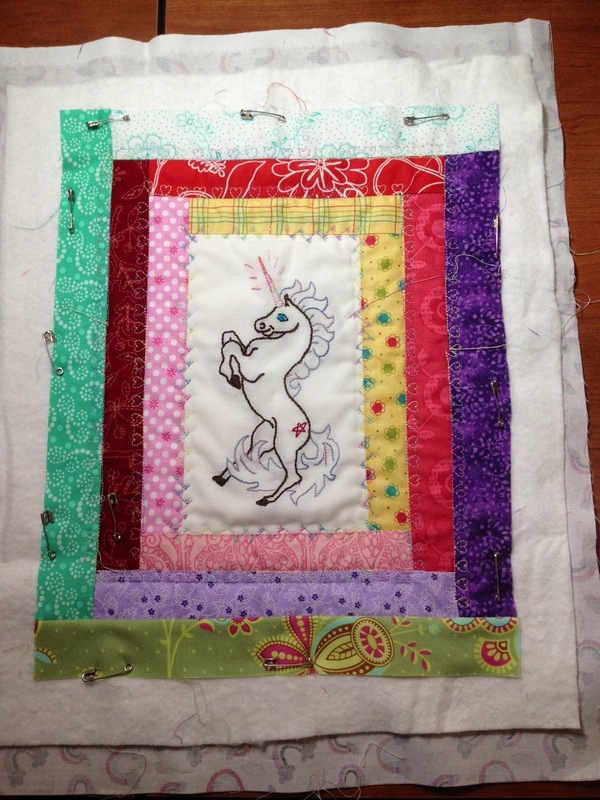 I did some machine embroidery on Miss S' Squirrel quilt so I thought I could so something similar on this Unicorn quilt. After doing the first round with a random zig zag pattern I decided to outline each boarder with the heart stitch from my machine. It really girlies up the rainbow quilt and Miss L loves it! Stitching Tuesday is in the books for this week - hopefully I will have more to show you next week. 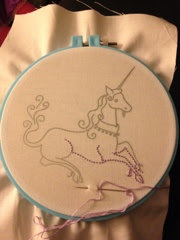 I feel like I have taken a bit of a leave from sewing the past little bit and filled my time with embroidery/stitching. I'm enjoying the portability of stitching and loving the fact that I am learning something new (and in addition to my step sister that got me started I found out that my step-sister-in-law also stitches and now my Sister as bought a bunch of embroidery stuff to start out on!!!!) so it seems like I have a pretty awesome little crew to stitch with (virtually in Sherrys case since she lives a few provinces away). I started another unicorn tonight for a mini quilt. 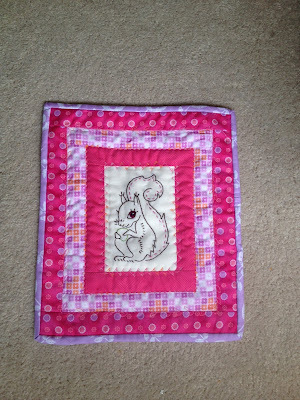 Maybe for a niece or maybe I will try to sell it at a craft show. I'm not sure. All I know is that I'm enjoying being crafty again even if its not with a sewing machine at the moment. Horrible iPhone pic - sorry!!! A while ago (holy cow that was back in May of 2011) I posted about my Crochet Epic Fail, it was a very simple dishcloth that went horribly wrong.....! 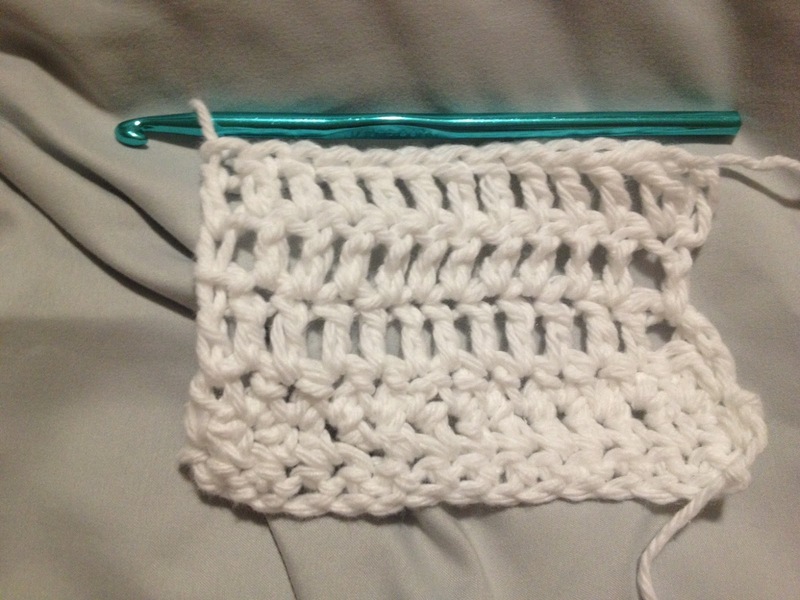 It was long and wonky and pretty much a perfect example of how horrible my crochet skills are. Its not nearly as epicly horrible as my original attempt at crochet but still more than a little wonky. Its just a few rows of single crochet and then a few rows of double crochet (I think...!) but I somehow managed to drop some rows and all that good stuff - oh well - I can only get better I figure! Now I'll get back to work on my newest stitching project while watching Fringe on Netflix with my husband! I would say that sounds like a fabulous way to spend a Wednesday night. Stitchy Squirrel - a Mini Quilt FINISH!!! After taking a bit of a bloggy break for the last almost month I feel like I can bounce back into the Blogging world, take it one day at a time and share what I've been working on with everyone. A few months ago my awesome Step-Sister Sherry sent me an embroidery 'starter kit' and I've actually been really enjoying sitting on the couch and making some little things for the girls. Miss S is completely in love with her little stuffed animal 'Special Kitty' and asked me to make a blanket for her a few weeks ago. I thought that would be the perfect time to try out a combination of Stitching and quilting and then I even used some of my fancy stitches on my sewing machine to quilt the top of the quilt. Here is a little bit of a close up on the stitches and the quilting. 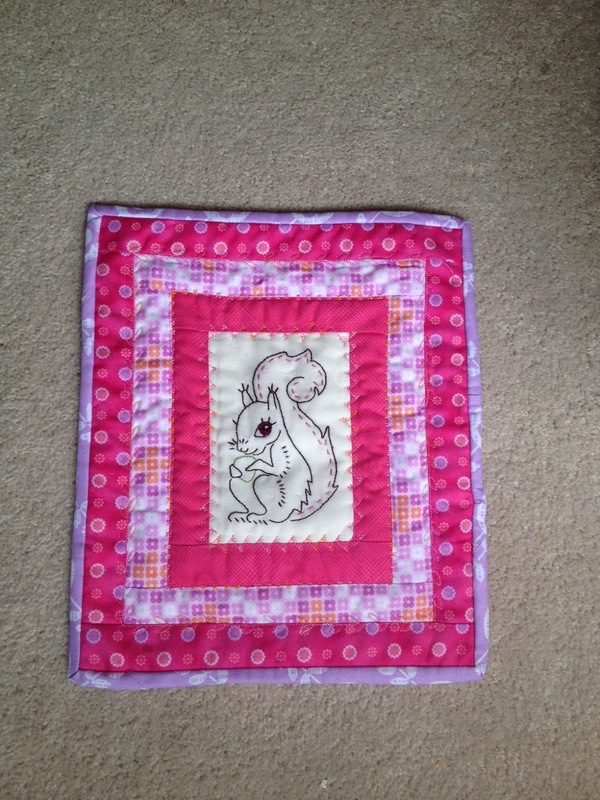 The quilt is 9.5 inches wide by 11 inches long - perfect for a beanie baby! Would you believe I haven't taken a single picture of Kitty with her blanket but this was a picture that my daughter wanted me to take before we got started on the quilt. Its my first real 'finish' of 2013 - its not a big finish but its a finish none the less!! Next up I need to get back to work on my scrappy trip quilt and then we are starting a new BOM quilt at my guild next month. So I do have some stuff to blog about and it will help get me out of the funk a little more! Thank you so much for stopping by - See you soon! Ever have one of those days (or couple of weeks) when you are blogging that you just think to yourself why am I doing this? Thats been me the past two weeks which is why I haven't blogged about anything. Sometimes I feel that all I post is stuff in progress and very rarely have an actual Finish to blog about and that must be boring for all of you to read about. 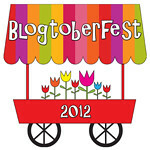 Maybe its just cabin fever getting me down but I just can't shake the blogging funk lately. Maybe I need to give up on the long blog posts and keep them short and simple for the next little bit....and hopefully that will break up the funk. 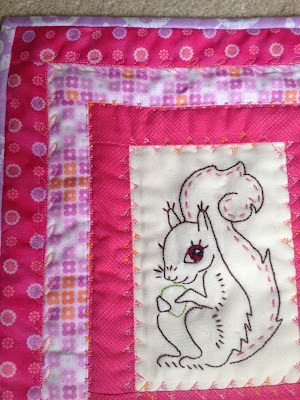 I'll post my stitchy squirrel mini-quilt tomorrow or Sunday and hopefully that will get the bloggy roll going again.